Boucheron is a French jewelry house founded in 1858 by Frédéric Boucheron. The jeweller worked with a wide range of golds as well as precious gems like rubies and peridots. His jewellery was inspired by motifs from nature like the snake, later chosento be the house's symbol. The first Boucheron boutique was established in 1858 in the Galerie de Valois at the Palais Royal in Paris. In... Read moreBoucheron is a French jewelry house founded in 1858 by Frédéric Boucheron. The jeweller worked with a wide range of golds as well as precious gems like rubies and peridots. 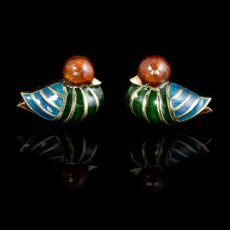 His jewellery was inspired by motifs from nature like the snake, later chosento be the house's symbol. The first Boucheron boutique was established in 1858 in the Galerie de Valois at the Palais Royal in Paris. In subsequent years, Frédéric Boucheron opened an atelier and began working with his nephew, Georges Radius. 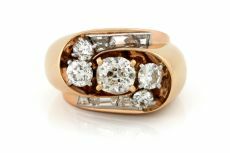 The play on shapes, manipulations of the material and combinations of gems had found their audience by the end of the 19th century. 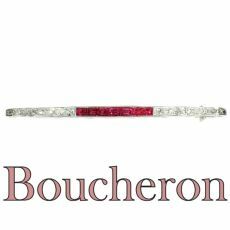 Boucheron was now attracting a clientele of writers, artists and princes. When Fédéric Boucheron died in 1902, his son, Louis, took over the house. As heir, he contributed to the label’s development, by reaching further than France alone. He opened a branch in Moscow and he also established a collaboration with the young jeweler, Pierre Sterlé. In 1954, his children, Fred and Gérard Boucheron, were next to take over the brand. 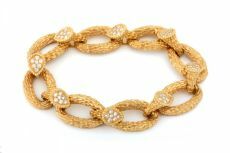 Maintaining the inherited expertise, they established the label in Japan during the 1970s, during which time Jane Birkin famously posed holding a Boucheron diamond necklace. Alain Boucheron became head of the company in 1971, and in 2000, the Gucci group acquired the Boucheron jewelry house. Under the direction of Jean-Christophe Bedos, new boutiques were inaugurated all over the world. In 2007, Boucheron was the first jeweler to open an e-commerce shop in Europe. In 2011, Claire Choisne was named creative director of the jewelry house at Place Vendôme. After a century and a half, the Boucheron jewelry house has become an important reference of fine jewelry and timepieces.